After Russia’s hockey failure at its home Olympics, ideas differ on how best to rebuild. The root of the problem may lie in the conflicted identity of the Kontinental Hockey League – should it be a rival to the NHL or an incubator for the Russian national team? Amid Russia’s cascade of gold medals at its home Sochi Olympics last month, there was one black mark on the host nation’s record. Of all the sports on the program, men’s hockey has the widest following in Russia and the national team’s 3-1 defeat to Finland in the quarterfinals was nothing short of a catastrophe. National team coach Zinetula Bilyaletdinov raged against the dying of the light, taunting journalists to “eat me alive” in the aftermath of the Finland game, but he was fired shortly after Canada beat Sweden 3-0 for the gold medal. The start of a rebuilding process began on March 26 when Bilyaletdinov’s replacement was named. 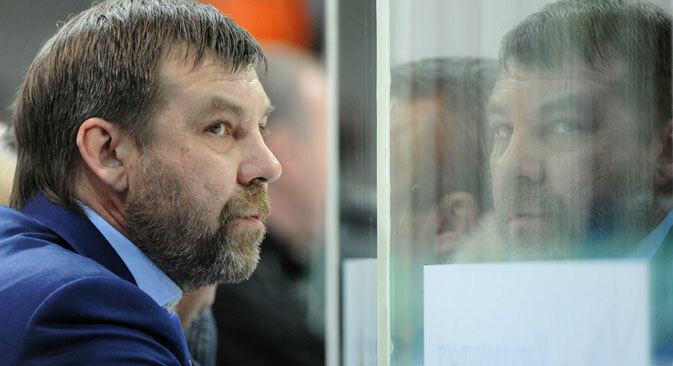 Oleg Znarok, who has coached Dynamo Moscow to the Kontinental Hockey League (KHL) championship in the last two seasons, is to take charge of Russia for the world championships in May. Znarok (sometimes known as Olegs Znaroks in a nod to his Latvian connections) is best known internationally for coaching Latvia at the 2010 Olympics, but during his time at Dynamo has become known for his devotion to playing a team game on the ice, without much reliance on star players. For Russia, which in Sochi looked more like a group of individuals than a team, Znarok’s approach could be just what’s needed. One option that was never on the table, despite something of a campaign by some Russian hockey writers, was bringing in a non-Russian coach (Znarok may hold German and Latvian citizenship, but he was born in Russia). A string of foreign coaches, most recently Italian Fabio Capello, have turned the Russian soccer team around in the last 10 years, but the deeply traditionalist Russian Hockey Federation remains wedded to the notion that a Russian must coach the team, even though that means choosing a coach who has little contact with the country’s North American-based NHL stars. Meanwhile, there has also been a growth in the number of foreign coaches in the KHL, the main league for Russia and Eastern Europe. The most prominent this season is Dave King, who coached the Canadian team at three Olympics, winning silver in 1992. In a twist of fate, King and Znarok met in the first round of this season’s KHL playoffs. Znarok’s Dynamo came in as reigning champion and top seed, but fell in a seven-game thriller to King’s Lokomotiv Yaroslavl, which plays a high-tempo forechecking game in the opponent’s zone. Lokomotiv now has the upper hand in its Western Conference semi-final duel with another big name team, SKA St. Petersburg. A win there would continue a fairytale run for Lokomotiv, which lost its entire roster and coaching staff in an air crash in 2011 and has been gradually rebuilding as a club ever since. The Olympic aftermath has also shown how the KHL as a whole is torn between its struggle to rival the NHL as a major international competition and a more Soviet-style view of club hockey as an incubator for the national team. While 28 teams in eight countries play in the KHL, 21 of those teams are in Russia and the league’s president is Russian politician Alexander Medvedev, meaning it can never quite be considered politically independent. The clearest example of that is in the league’s limits on foreign players. Russian teams can have a maximum of five non-Russians on the roster, but the equivalent limits for non-Russian teams are so lax as to be meaningless. The stated aim is to ensure that young Russian talents get ice time without being crowded out by foreigners, but in practice means that mid-level older Russians can ask for higher wages, secure in the knowledge that one of the Russian teams will have to meet those demands to fill its roster. Meanwhile, the non-Russian clubs can hire cheaper U.S. and Scandinavian players at will, creating rosters that can compete for a fraction of the cost. While the disparity has always been there, the KHL’s expansion has brought matters to a head this season. Three non-Russian teams are in the last eight of the playoffs, the highest number ever, and with much smaller budgets than their Russian opponents. In the starkest contrast, tiny Croatian team Medvescak Zagreb stacked its roster with minor-league North Americans (and ex-NHL All-Star Jonathan Cheechoo) and finished above CSKA Moscow in the regular season despite having less than one-eighth the payroll of the Russian club. In effect, the foreigner limit is acting as a brake on Russian clubs. The KHL clubs have voted overwhelmingly for a modest raise in the foreigner cap next season, but that could be blocked after Russian President Vladimir Putin used a televised address to signal his disapproval. While the government can’t formally alter KHL rules, most of the 21 Russian clubs in the league rely on the state for funding, so a U-turn could be on the agenda. Whatever happens, the question of how Russian hockey should bounce back from its Olympic failure is sure to prompt heated debate for a long time to come.